Sounds a little ominous but the Gewürztraminer really did enjoy it. And how do I know it did? – by all the bubbling activity in the yeast! The Gewürztraminer grapes were picked early in the morning on Friday Sept. 16 and brought straight from Floodgate Vineyard to the winery where they were pressed over the course of 2.5 hours then left in a tank to settle for 24 hours. After being in tank we need to separate the juice from the lees. The lees are the particulate matter that precipitates out of the juice and settle to the bottom of a tank or barrel. 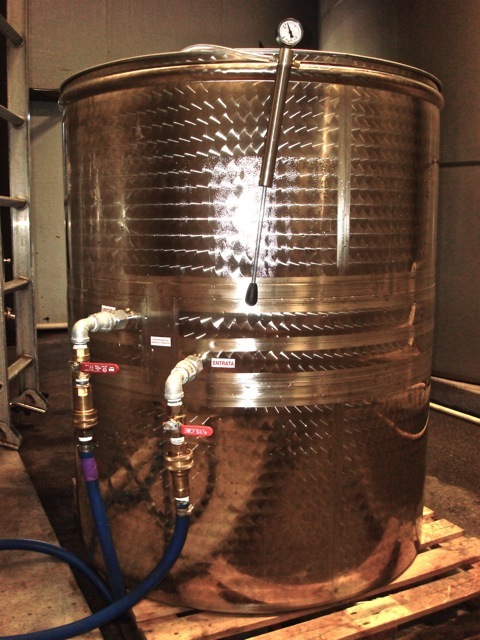 In order to “rack” the juice from the lees, we needed a forklift, another tank, some large tubing, and our friend Amato. There is all sorts of equipment to clean and sterilize in order to get the juice from the tank it settled in to the fermentation tank (a stainless steel temperature controlled tank). So the first hour of this process was cleaning tanks, tubes, lids, thermometers, etc. Luckily, we all have big old rubber boots keeping our feet and legs dry. Once everything was clean, we connected the settling tank to the fermentation tank with a hose and opened the valves and let the juice flow. In order to make sure we were not bringing the lees from the settling tank into the fermentation tank, there is a looking glass on the fixture attached to the settling tank so if you hold a flashlight up to it, you can see the clarity of the juice. Thus, when you start to see some lees flowing, you close the valve and you’re done. The lees are fermented separately and that wine may be included in the final wine if it has flavor or aroma that we desire in the finished wine. The Gewürztraminer rested for another 24 hours in the fermentation tank before inoculation with yeast. Yeast smells delicious when it is mixed with warm water, think lemon bread baking in the oven. When the yeast were bubbling up happy with the warmth, we then needed to very gently cool them down without shocking them and causing them to stop multiplying. The reason we needed to cool them down was that the juice in the tank was at 44degrees F so had we just poured the warm bubbly yeast in, they may have been so startled by the cold that they would shut down and not kick off the fermentation. So over about an hour and a half we slowly added juice from the tank to the yeast container and waited for it to acclimate before adding more juice. It’s a little bit like watching paint dry except that the yeast becomes thicker and foamier as they consume the sugar in the juice. Eventually, the temp got where it need to be (within 10 degrees of the juice) and all the yeast got added to the fermentation tank where they are now slowly ticking away fermenting the Gewürztraminer juice. This will be a nice, slow ferment over the next 2 – 3 weeks. If it ferments too quickly (which happens if the juice gets too warm) then it runs the risk of burning off some of the aromatics that are so beautiful in Gewürztraminer. The target temp for this ferment is right around 50 deg F.
Here is what the juice looks like four days into the ferment. 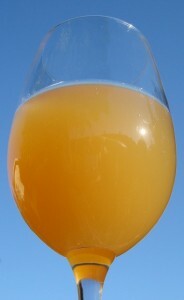 It has wonderful apricot and black tea aromas right now and a fizzy peach nectar flavor. It will stay this slightly cloudy color until late in the fermentation when the yeast die off and settle to the bottom of the tank. If you’re in the area now (sept 2010) and want to taste the awesome flavors of fermenting Gewürz. Let us know. Hmmm…anybody taking a chance on ‘orange’ Gewurz, fermenting on lees & autochthonous yeast?